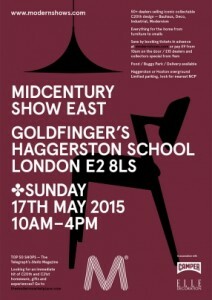 We are looking forward to our second Midcentury show of the year. This time its the Midcentury Show East at the fabulous Erno Goldfinger’s Haggerston School. The show not only showcases the best in Midcentury design with dealers bringing the best furniture, ceramics, glass, wallpaper, vintage fabrics, industrial, clocks, collectable posters and much more – it also give you a chance to see the stunning architecture of the school. Built in 1964-5 the school is now a Grade II listed building with its great use of space, innovative use of materials and cutting edge design. The Hungarian-born London-based Modernist was one of the first architects to develop the aesthetic use of concrete in the UK, inspired by Auguste Perret and Le Corbusier.